Colleges in the Kutch district were regulated under the Gujarat University till 2003. However, following the development drive post 2001 Gujarat earthquake, the government of Gujarat decided to provide a separate university for the region of Kachchh. 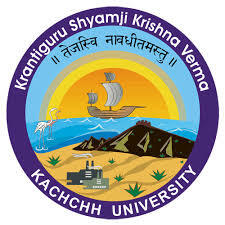 The Krantiguru Shyamji Krishna Verma Kachchh University Act was published in the government Gazette in March 2003. The foundation stone for the building was laid on 24 September 2004. The construction work for the administrative blocks, four faculty blocks, library, computer building, guest house, hostels was estimated at 35 crores (funded by Gujarat State). The Kachchh University started its administrative and academic activity at the new developing campus in 2007. The university started with 10 colleges in 2004, having 44 colleges with more than 20,000 students and nearly 250 teachers working in the faculties of Arts, Commerce, Science, Education, Law, Technology including Engineering and Pharmacy.